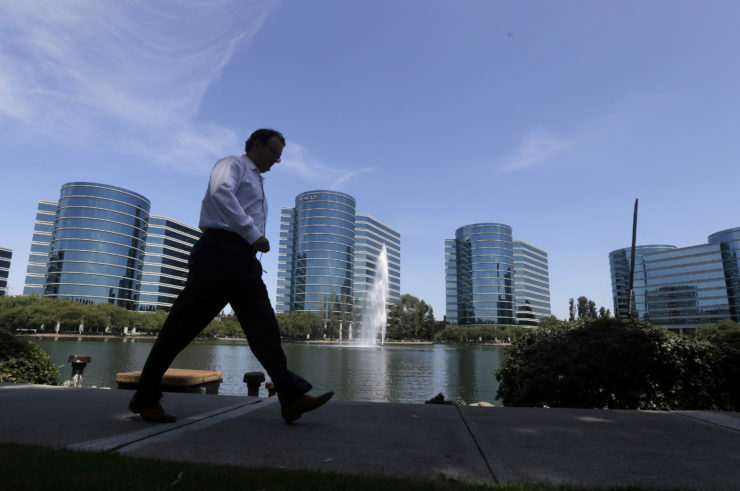 In this 2014 photo, a man walks in front of the Oracle campus in Redwood City, Calif. Oracle is one of many Silicon Valley tech companies that does not make its EEO-1 diversity data public. Last fall, Reveal from The Center for Investigative Reporting asked hundreds of tech firms headquartered in California’s Silicon Valley to make their diversity data public. Only a couple of dozen have so far. So Reveal obtained diversity data for 177 large tech companies through a unique collaboration with researchers with access to that data. Every company with more than 100 employees in the United States has to submit an annual form – called an EEO-1 report – to the federal government with employee breakdowns by gender, race and job category. But most companies don’t make their forms public, and the federal government keeps the data confidential. Last year, Reveal created a list of 211 of the largest tech companies headquartered in the San Francisco Bay Area and asked them to release their data publicly. Reveal based its list on the SV150 list by The Mercury News in San Jose of top publicly traded technology companies and the CB Insights and Crunchbase lists of “unicorns” – private companies valued at $1 billion or more. Reveal’s list was current as of Aug. 3, 2017. This means companies that went public after the list was created, such as Stitch Fix, are not included. The list has not been updated based on mergers and acquisitions after that date. Some companies, including Nvidia, Pinterest, Square, Clover Health and View, released their numbers in response to Reveal’s request last year. Others, including Google, Apple, Facebook, eBay and Intel, already released their numbers every year. A few released their EEO-1 reports after Reveal’s story last year. PayPal released its numbers publicly for 2015, 2016 and 2017. Messaging company Slack also released its EEO-1 report for the first time, but only for 2017. In addition, Reveal filed Freedom of Information Act requests with the U.S. Department of Labor for the EEO-1 reports of tech companies that are government contractors. The department shares such requests with the companies and asks whether they object. When companies such as Palantir Technologies, Oracle and Pandora Media objected, saying their diversity numbers are a trade secret, the department denied Reveal’s request. Through FOIA requests, Reveal obtained EEO-1 reports for two companies, Sanmina and NetApp, for 2015 and 2016. NetApp publicly released its 2017 EEO-1 on its website. Reveal also obtained the 2015 form for a third company, VMware, and has a pending request for its 2016 form. In total, Reveal has obtained 2016 EEO-1 forms from 26 companies. Several large tech companies, including Facebook, have yet to release their 2017 EEO-1 forms, and the latest available data for all 177 companies is for 2016. Reveal’s focus and analysis for this story, as well the previous one, is for 2016 only. Here’s the data set for all the publicly released EEO-1s for 2016. Researchers at the Center for Employment Equity at the University of Massachusetts Amherst have a special contract with the federal Equal Employment Opportunity Commission under which they have access to EEO-1 data for all companies in the U.S. In a collaboration with the researchers, Reveal gained access to demographic data broken down by race, gender and job category for the 177 companies. It was made anonymous because the center has access to this data under strict confidentiality agreements. But it allowed for first-ever comparisons. Reveal provided the equity center with its list of the 211 companies from last fall. The center matched the companies against its national database and found 178 matches of companies that submitted EEO-1s to the federal government. Some companies had fewer than 100 employees in 2016 and therefore were not required to submit EEO-1s. It’s also possible that some may have been required to submit an EEO-1 form but failed to do so that year. One of the companies that released its data publicly was the pharma tech company Clover Health. During the course of reporting, Reveal found that Clover Health had reported erroneous numbers to the federal commission. The company said it submitted a corrected form after questions from Reveal, but to be fair and consistent, we excluded Clover Health from the data. For each job category, there are 177 data points of percentages for each race and gender combination. For instance, for Latina executives, there are 177 percentages, each representing Latina executive representation at one company. Data from companies that have shared their EEO-1 reports has the company’s name attached to the data point (more details below), but the others are anonymous. If there are fewer than 177 data points for a job category, that means some firms had no employees in that category. For instance, there were three firms in the data set that did not employ anyone in support jobs such as sales workers, administrative support, technicians and others. This allows us to see the distribution of firms by demographics and job categories, helping us rank firms and point out outliers on the spectrum. This data does not allow us to reconstruct an anonymous firm’s EEO-1 form. For each demographic and job category, we have firm-level percentage data for 177 firms, but we cannot connect an anonymous firm’s percentage on one demographic scale to another parameter. For example, even though we know an anonymous firm’s percentage of black executives, we can’t say what that firm’s numbers are for white executives. The data does not include the actual numbers of employees for any anonymous companies, as that could identify an individual company. The data also is rounded to one decimal place to ensure further confidentiality. Reveal combined anonymized percentage distributions from the Center for Employment Equity with Reveal’s data set of EEO-1s. We systematically identified the companies that have publicly disclosed their numbers in the anonymized data set and removed duplicates. We then ranked the firms for every demographic and job category by the percentage of employees in the firms. We used the ranking method called min in pandas, a Python statistical library. If two firms have the same percentage of employees for a certain demographic or job category, we gave them the same rank. For example, if there’s a tie between two companies for the second spot, they both would get rank 2, and the next company on the list would get rank 4. No firm would get rank 3. We used medians to identify the midpoint of each distribution. We also have industry averages for the 177 companies here. EEO-1 forms are not complete by any means, because they don’t include any statistics about age, disabilities or sexual orientation. In addition, on EEO-1 forms, all employees must be classified as either female or male, thus obscuring any information about employees whose gender identity does not fit into those two categories. Any annual form is merely a demographic snapshot of a company in time and does not capture when employees enter or leave a company. But standardized reports can help us establish a baseline. The definitions for demographic groups, especially when aggregated such as for women of color, remain the same as for our previous story: “People of color” includes all employees who are not white. “Women of color” includes all women who are not white. “Underrepresented minority groups” includes groups such as black, Latino, Native Hawaiian or Pacific Islander, American Indian or Alaskan Native, and two or more races; it excludes those who are white or Asian. “Underrepresented minority women” includes all women, except white and Asian women. EEO-1 reports also include a category called “two races or more,” which does not specify which races are included. Those employees are included in our “underrepresented minorities” category. Job category definitions are the same as those in the EEO-1 reports. Professionals include tech workers such as software engineers and web developers, as well as lawyers, accountants and analysts. Managers are classified as “first/mid officials and managers” in EEO-1 reports. Executives in our analysis are called “executive/senior officials and managers” in EEO-1 reports. The bulk of our analysis focuses on executives, managers and professionals. We have included a category with technicians, sales workers, administrative support and other job groups. Here’s the list of definitions of the job categories by the Equal Employment Opportunity Commission. Reporter Will Evans and senior data reporter Eric Sagara contributed to this story. It was edited by Michael Corey and Amy Pyle and copy edited by Nikki Frick. Sinduja Rangarajan can be reached at srangrajan@revealnews.org. Follow her on Twitter: @cynduja. Silicon Valley’s utopian vision is overlooking a key demographic: its workers.